Genesis Minerals Limited (ASX: GMD) is an Australian gold exploration and mine development company with high quality projects located in Western Australia’s premier gold districts. Genesis is targeting a long-life standalone underground gold mining and processing operation with drilling focussed on significantly expanding the current Mineral Resource. The Ulysses Project is emerging as a significant large-scale gold system. 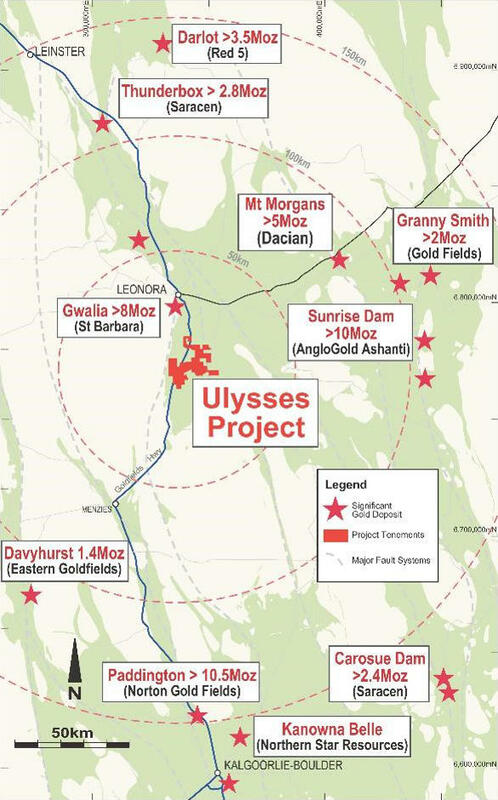 The 100% owned Ulysses Project (“the Project” or “Ulysses”) is centred about 30km south of Leonora and 200km north of Kalgoorlie in Western Australia. Ulysses is located in the minerals rich and highly prospective Eastern Goldfields of Western Australia. It is located 30km south of the Sons of Gwalia (6Moz of Production and 1.8Moz Reserve) mine and along strike of Orient Well and Kookynie mine camps which have produced over 0.7Moz (see Figure 1). Results from step-out drilling is providing further evidence that Ulysses is emerging as a significant large-scale gold system with excellent potential to underpin a future standalone underground gold development.